A book of boating trivia for the sailor who has everything. Have you ever wondered about the boats used to film all the mutinies on the Bounty? How about the boats used in the Perfect Storm? We know all about the boat used in Master and Commander (that’s the Rose and she used to decorate the dock at Captain’s Cove in Bridgeport CT ), or do we? Here’s a book that has something about just about every boat you can name, real or imaginary. Full of facts and trivia tips, this book will keep any boating buff occupied on a rainy day. Name that Boat! will please you with it’s interesting, intriguing and wide-ranging questions taken from boats real and imagined. History, TV, literature, moviesyou name that boat and chances are you’ll find it here. Read Name that Boat! and amaze and surprise with your knowledge of this specialized area of trivia. After all, how many of us know the name of the boat that brought the Statue of Liberty to America or the Maltese Falcon to San Francisco ? And thinking of Bogart, what was the name of the boat he and Katherine Hepburn brought to stardom on the big screen? Come on you know this one! The author has a degree in philosophy lives in the Santa Cruz, California area, and has been a life long sailor and trivia buff. 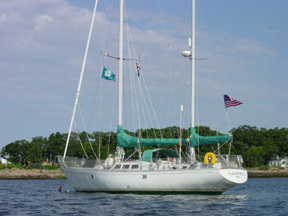 As first mate, she sailed a Ranger 33 named “Valkyrie” with her husband, Captain Edward Mueller, off the coast of California . She has done extensive research and maintains a library filled with books relating to all types of boats real and imagined.